Did that prairie dog just call you fat? Quite possibly. On The Current Friday, biologist Con Slobodchikoff described how he learned to understand what prairie dogs are saying to one another and discovered how eloquent they can be. Slobodchikoff, a professor emeritus at North Arizona University, told Erica Johnson, guest host of The Current, that he started studying prairie dog language 30 years ago after scientists reported that other ground squirrels had different alarm calls to warn each other of flying predators such as hawks and eagles, versus predators on the ground, such as coyotes or badgers. 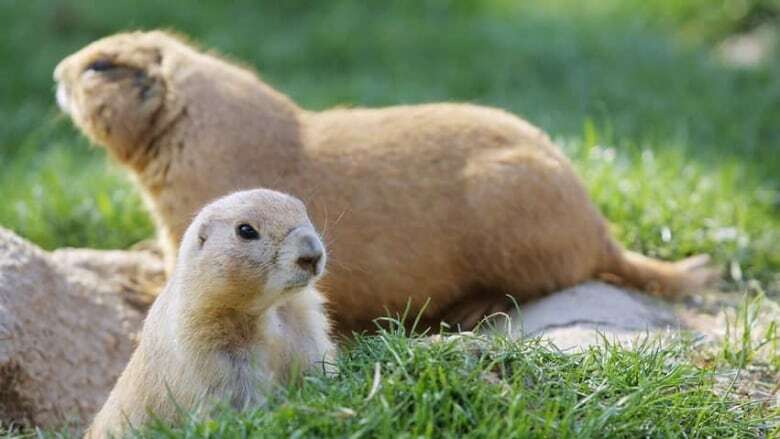 Prairie dogs, he said, were ideal animals to study because they are social animals that live in small co-operative groups within a larger colony, or "town" and they never leave their colony or territory, where they have built an elaborate underground complex of tunnels and burrows. In order to figure out what the prairie dogs were saying, Slobodchikoff and his colleagues trapped them and painted them with fur dye to identify each one. Then they recorded the animals' calls in the presence of different predators. They found that the animals make distinctive calls that can distinguish between a wide variety of animals, including coyotes, domestic dogs and humans. The patterns are so distinct, Slobodchikoff said, that human visitors that he brings to a prairie dog colony can typically learn them within two hours. But then Slobodchikoff noticed that the animals made slightly different calls when different individuals of the same species went by. "With a sudden intuition, I thought, 'What if they're describing the physical features of each predator?'" he recalled. He and his team conducted experiments where they paraded dogs of different colours and sizes and various humans wearing different clothes past the colony. They recorded the prairie dogs' calls, analyzed them with a computer, and were astonished by the results. "They're able to describe the colour of clothes the humans are wearing, they're able to describe the size and shape of humans, even, amazingly, whether a human once appeared with a gun," Slobodchikoff said. The animals can even describe abstract shapes such as circles and triangles. Also remarkable was the amount of information crammed into a single chirp lasting a 10th of a second. "In one 10th of a second, they say 'Tall thin human wearing blue shirt walking slowly across the colony.'" Besides being a researcher, Slobodchikoff is an author of the book Chasing Doctor Doolittle: Learning the Language of Animals, in which he profiles many other animals with complex language, including crows and ravens, chickens and vervet monkeys. He believes complex speech is probably common within the animal kingdom. "It's just that we have not looked," he said. He blames the fact that humans have long assumed animals are incapable of such intelligence. Slobodchikoff said he has been working with a computer scientist to develop a device that uses voice pattern recognition techniques and artificial intelligence to translate between human and animal speech. "We could potentially have something maybe the size of a cellphone in five to 10 years where a dog would say, 'Woof' and the device would say. 'I want to eat chicken tonight" or a cat could say, 'Meow,' and the device would say, 'My litterbox is filthy, please clean it.'" He thinks if humans and dogs could understand one another more clearly, it would reduce the number of animals euthanized each year because of behavioural problems, which he blames on a lack of communication. In the meantime, Slobodchikoff said, he has found that just knowing that animals can share complex ideas makes people more empathetic toward them. "When people realize that prairie dogs and other animals as well can talk … suddenly they see these animals with a new perspective," he said. "They're actually thinking, breathing things not that much different from us."